David Jaffe has had enough, and you can't really blame him. CNN's Erin Burnett took to the airwaves this week and presented the sensationalist videogames-create-killers argument as fact. Not surprisingly, this isn't sitting well with those involved in the industry. 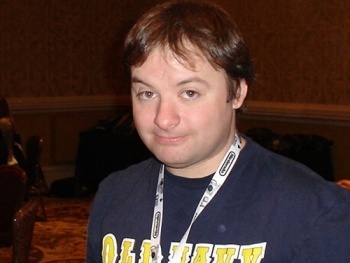 The always outspoken David Jaffe is one of those people, and he took to Twitter today to launch his own war of words against Burnett and her perceived agenda against the hobby. "Dear ErinBurnett: you, ma'am, are at best an idiot that cnn should be ashamed to have as an anchor," Jaffe begins. "At worst, you are the worst kind of American: one who has allowed the healthy desire for success to morph into a capitalistic cancer that makes it ok to ignore the facts in order to make your product more appealing, regardless of the consequences." But the man behind games such as Twisted Metal and God of War didn't stop there. "I am sure you will think yourself quick and insightful when you tell me- a video game director/designer accusing someone from another industry of making products for profit regardless of consequence- that I am the pot and you are the black kettle," he continues. "However, if you actually listened to your guests and read the studies (aka if you actually did some....some....hmmm, what's that word you journalists have for it? Oh right: RESEARCH!) you would see you are wrong; you would see there remains- after years of studies- zero evidence of video games with violent subject matter causing real life violence." Eventually, Jaffe sums up his feelings, adding "Shame on you. But more importantly: shame on your profession. It deserves so much better." To be fair, Burnett's attempts to get her guest, the respected Dr. William Pollack, to slap some type of blame on videogames as a cause of violence do push the boundaries of good taste. She starts her questioning by stating "It's accepted as fact that these violent games - and by the way, they are horrifically violent - is why we are seeing this seemingly [sic] explosion in mass shootings." Even when Dr. Pollack insists that, no, games are not a root cause of real-world violence, Burnett pushes on, likening games such as Call of Duty to "training" simulations for killers. It's the same disjointed, out of touch stance gamers have been dealing with for years, and it appears that Jaffe has simply had enough. Personally, I can't really blame him.